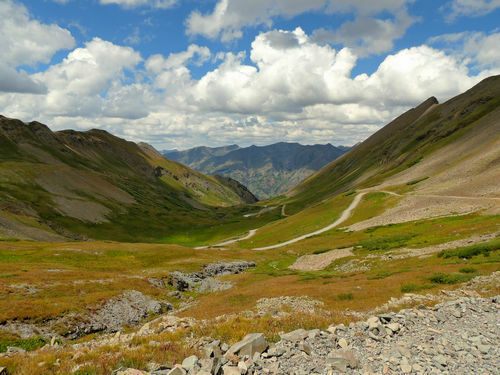 Stony Pass is another way to get from Silverton to Highway 149, although it is not a great way. 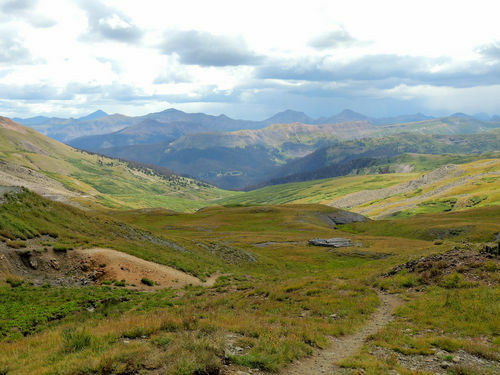 The Jeep trail is not very difficult, but it is 38 miles long and the section from Kite Lake to the Rio Grande Reservoir (10 miles) is bumpy and boring. From there to Highway 149 is well graded. Unless you are simply looking for something to do, spend your time west of Kite Lake. One of the most interesting things about the descent on the east side of Stony Pass is the fact that you can see small streams along the trail. These are streams starting at the Continental Divide and they are the headwaters of the Rio Grande River. 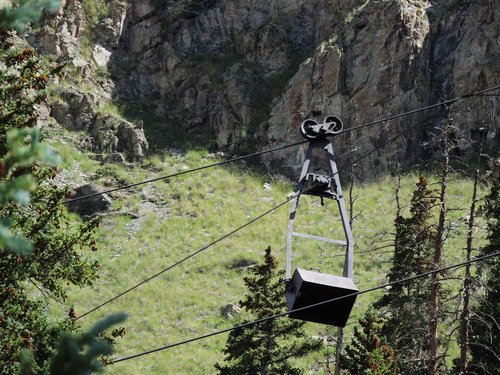 As you start up the west side, watch for what is left of the Buffalo Boy aerial tramway with a few tram buckets still attached. 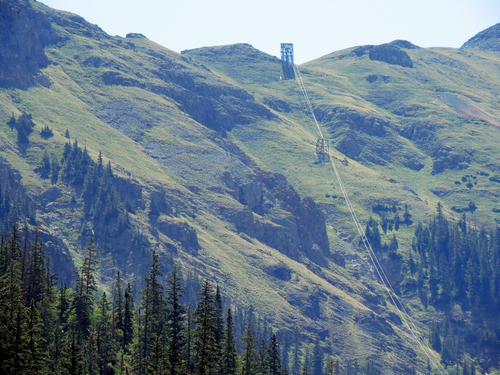 The Buffalo Boy 2.5 trail will take you to the upper end of the tramway. 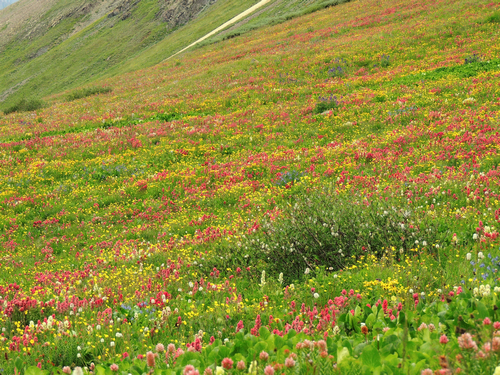 Wildflowers are fantastic on the west side of the pass if you are there at the right time of the year - a bit later in the season than most of the San Juans. 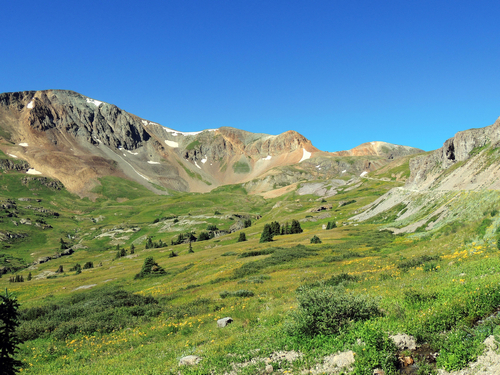 Sheep will be grazing all the high country at certain times through the summer. They are the small white dots in the photo. 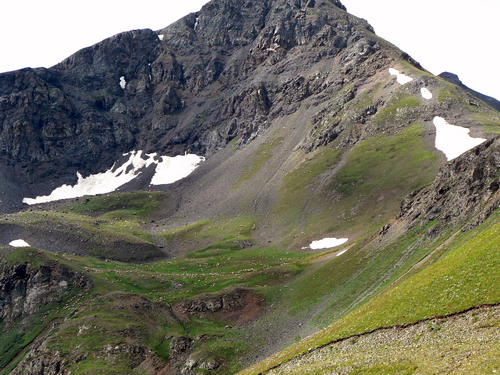 Stony Pass is 12,592' elevation.